Rocky Island is an upcoming tourist destination in the Samsing hills of Dooars region in northern Bengal. The name Rocky Island promises lot of adventure and the place actually fulfills them. The name not only promises adventure but also evokes images of big and small rocks making an interesting trail for the tourists to follow. Well, the place has it all and once you reach there you will know that it has lived up to your expectations. You will spot massive rocks on the island named as Bhimsen, Hansdunga, Pathar Kailas, and Neel Kanta. Rocky Island is about 3 kilometers uphill from Suntalekhola and is an enchanting place away from the crowds amidst the sound of the flowing Murti River. Samsing is a small hamlet located on the border of Jalpaiguri and Darjeeling in the foothills. Enjoying an elevation of 3,000 feet, Samsing is beautiful in its natural glory. The vast landscape, forests, hills, tea gardens add to the charm of this hamlet which is increasingly becoming a popular tourist destination. The village is divided into two sections- the tea garden area and the basti that is the settlement zone which is inhabited by around 2500 people. Samsing is 8 kilometers from Meteli, 15 kilometers from Chalsa, 19 kilometers from Malbazar, 50 kilometers from Mongpong, 80 kilometers from Siliguri and 26 kilometers from Gorumara. The land experiences mild weather throughout the year which is another reason for its popularity as a tourist destination. Reaching Samsing is easy because it’s accessible by road. It’s a 3 hour drive from Siliguri and the route is most rewarding. It has visually stunning and picturesque landscape which seems like the backdrop of a romantic film. On the National Highway-31 you have to cross Malbazar to reach Chalsa from where its 15 minutes drive to Meteli by taking the left turn. These 8 kilometers is the most rewarding because the road is flanked by sprawling tea gardens- the Samsing and Zurantee tea gardens making the route enchanting. However, the road leading to Samsing is quite narrow so one must drive carefully. Samsing provides plenty of accommodation facilities to the tourists. Suntalekhola is the ideal place to stay and most of the tourists put up at the cottages here. Suntalekhola is about 4 kilometers uphill from Samsing and has well facilitated cottages and bungalows maintained by West Bengal Forest Department. Cross a small hanging bridge to arrive at the government resort at Suntalekhola. Alternatively, you can stay at the Rocky Island Nature Resort which is located on the banks of Murti River. You will be provided tents for overnight stay to enjoy the beautiful and mysterious atmosphere of the region. If you wish to see the lifestyle of the local people, then Faribasti homestay will be the best option for you. Experience their hospitality and also their love for nature. Staying at any of these places will be a treat for your eyes because of the pristine nature and of course the meandering Murti River. 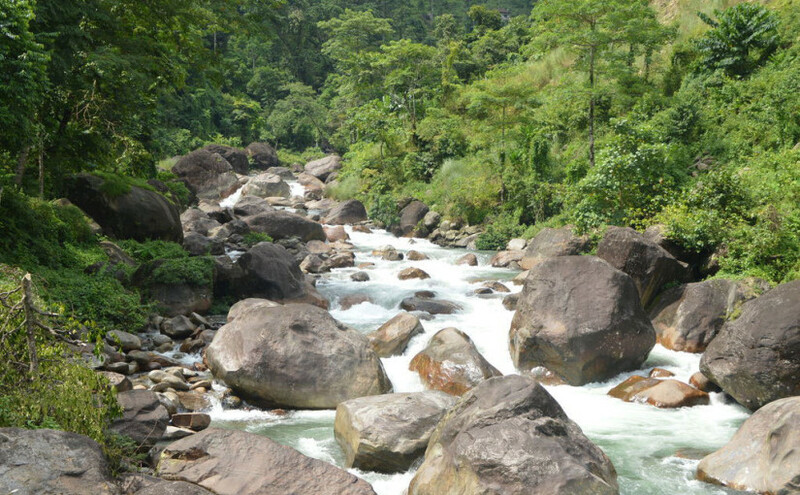 The river turbulently flows from Neora Valley National Park through Samsing to reach Jaldhaka near Gorumara National Park. You can also hear the sound of the water splashing against the rocks. At Suntalekhola you will notice a beautiful orange stream flowing through the land and making it picturesque. Suntalekhola and Rocky Island also serve as picnic spots for local people along with Laliguras which is again a beautiful place with lush greenery amidst mountains. For adventure take the trek routes originating from Suntalekhola leading to Neora Valley national Park. But you must seek permission from the forest department to enter the park. Other trekking routes lead to Tree Fern Point and Mo or Mo Chaki from where the Himalayan Mountains are visible on one side. The snow covered Jalep La pass is also visible from here.